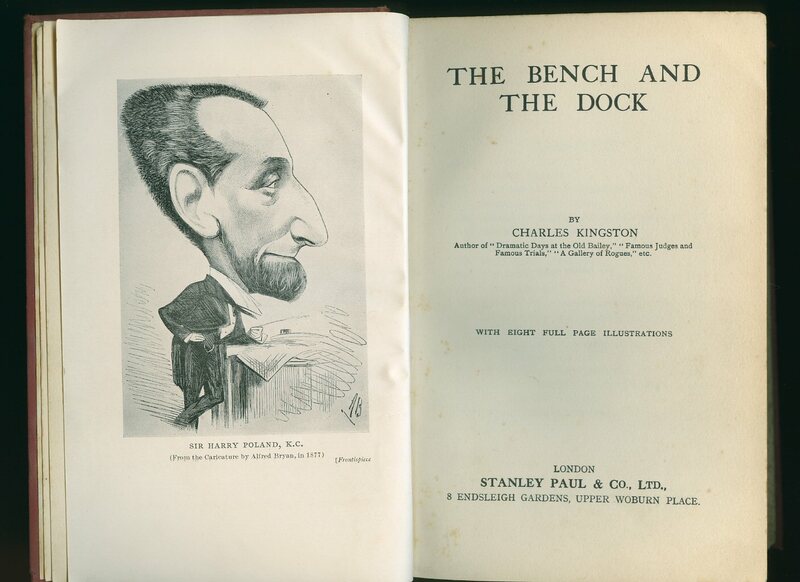 Published by Stanley Paul & Co. Ltd., 8 Endsleigh Gardens, Upper Woburn Place, London First Edition 1925. London 1925. First edition hard back binding in publisher's original dark red cloth covers, gilt title and author lettering to the spine. 8vo. 8½'' x 5½''. Contains 290 printed pages of text. Spine ends softened and frayed, foxing to the age darkened closed page edges, light foxing to some pages and in Good condition, no dust wrapper. Member of the P.B.F.A. Published by Association of Municipal Corporations, London and Printed by The Solicitors' Law Stationery Society Ltd., Flaxman Terrace, Dukes Road, London 1960. 1960. Hard back binding in publisher's original racing green pebble cloth covers, gilt title lettering and date to the spine, red flecked page edges. 4to 11'' x 8½''. Contains 85 printed pages of text. In Very Good clean condition, no dust wrapper as issued. 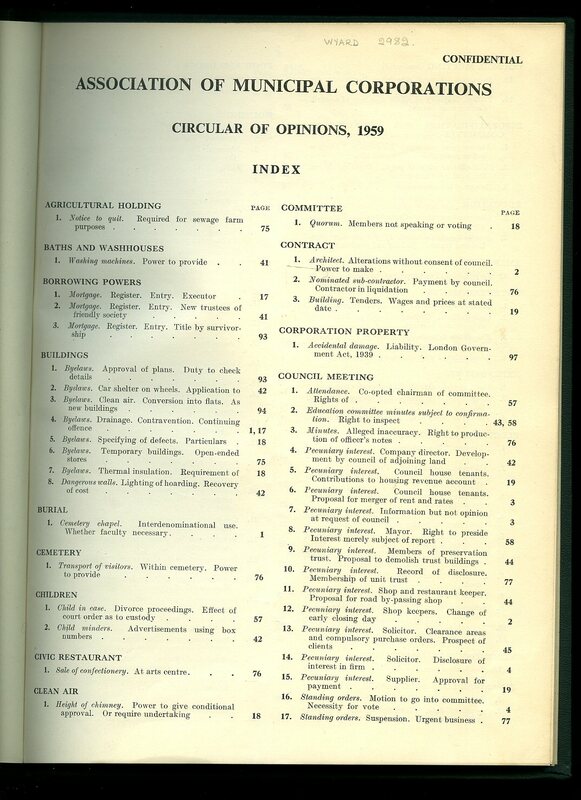 We currently hold in stock 20 other Association of Municipal Corporations (A. M. C.) Quarterly Circular of Opinions years. Member of the P.B.F.A. Published by Association of Municipal Corporations, London and Printed by The Solicitors' Law Stationery Society Ltd., Flaxman Terrace, Dukes Road, London 1970. 1970. Hard back binding in publisher's original racing green pebble cloth covers, gilt title lettering and date to the spine, red flecked page edges. 4to 11'' x 8½''. Contains 92 printed pages of text. In Very Good clean condition, no dust wrapper as issued. 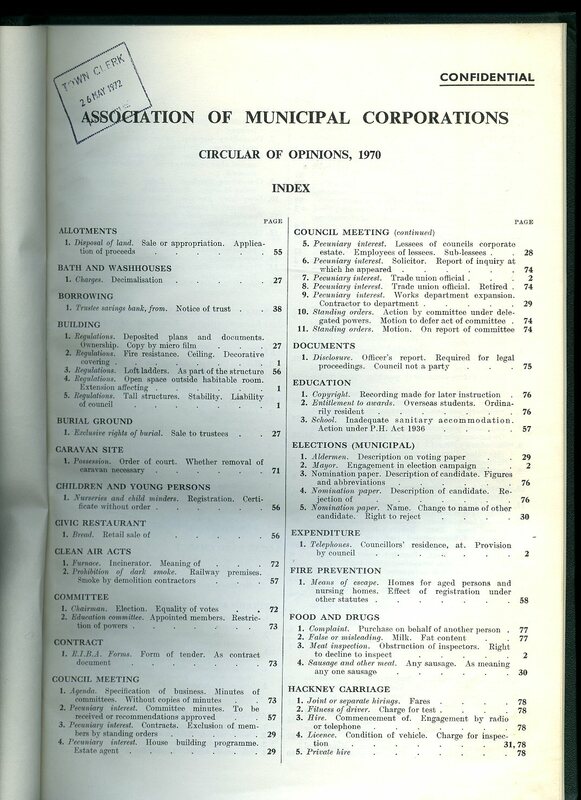 We currently hold in stock 20 other Association of Municipal Corporations (A. M. C.) Quarterly Circular of Opinions years. Member of the P.B.F.A. Published by Bowes & Bowes Cambridge First edition 1953. 1953. First edition hard back sage green cloth covers and page tops, gilt titles. 135 pp. Book in Fine condition. Dust wrapper with short closed tear to foot of upper fore edge, tiny rubs to spine tips, not price clipped and in Very Good condition. Dust wrapper protected. Member of the P.B.F.A. 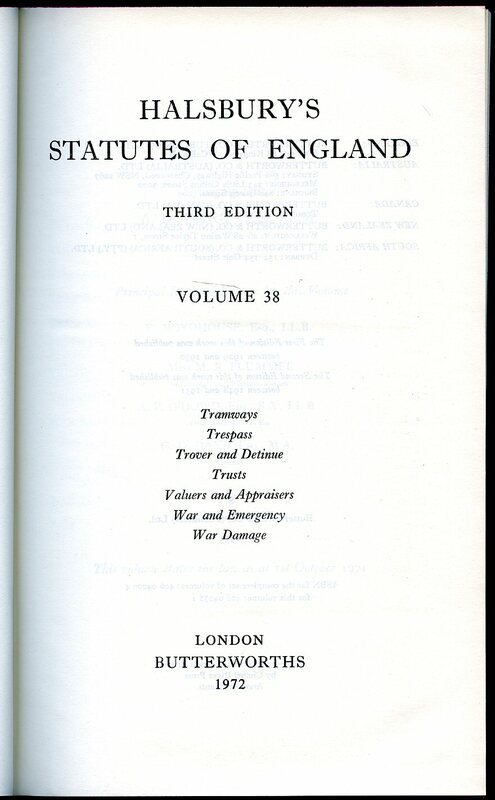 Published by University of London Press Ltd., Third edition 1947. 1947. Hard back beige cloth covers with maroon titles. xxiv, 316 pp. Book in Fine condition. Dust wrapper with light shelf rubs to both panels, not price clipped and in Very Good condition. Member of the P.B.F.A. 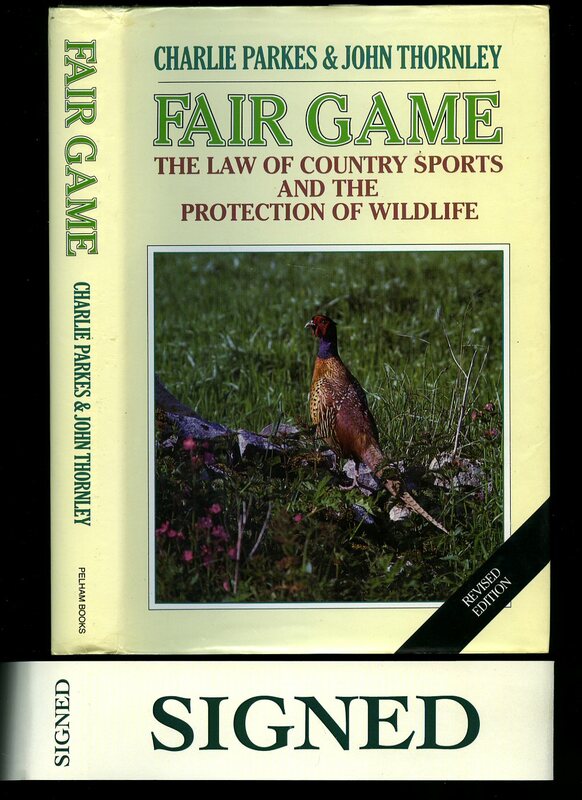 Published by Pelham Books, London 1991 Revised Edition. London 1991. Hard back binding in publisher's original green paper covers, silver lettering to the spine. 8vo 9½'' x 6¼'' 268 pp ISBN 0720719151. Monochrome illustrations throughout. Free from inscription. Fine condition book, in Very Good condition dust wrapper with small crinkle of the paper to the spine tip, not price clipped. Dust wrapper without any tears or chips and supplied in archive acetate film protection, this protects and prolongs the life of the paper, it is not adhered to the book or to the dust wrapper. SIGNED by both author's to the title page. Member of the P.B.F.A. 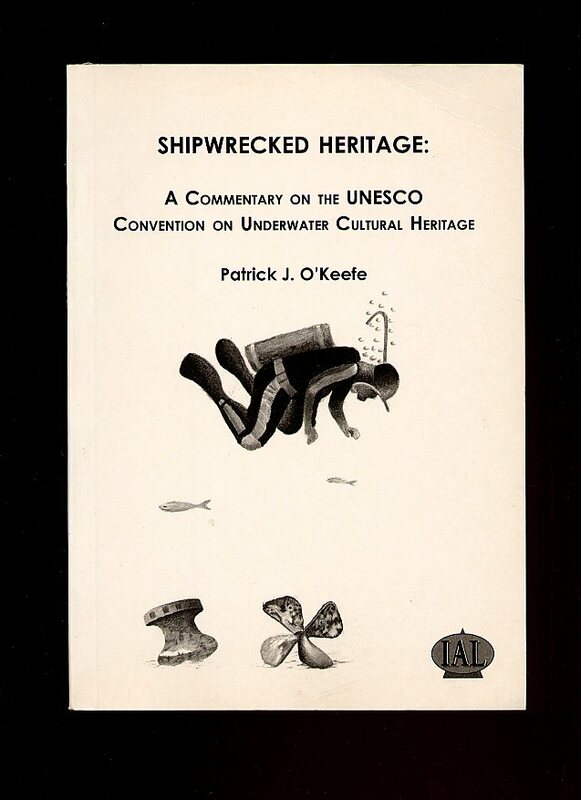 Published by Butterworth & Co. Ltd., Bell Yard, Temple Bar, London 3rd Edition 1972. 1972. Hard back binding in publisher's original deep burgundy cloth covers, gilt title lettering and volume details to the spine. 8vo. 10'' x 6¼''. 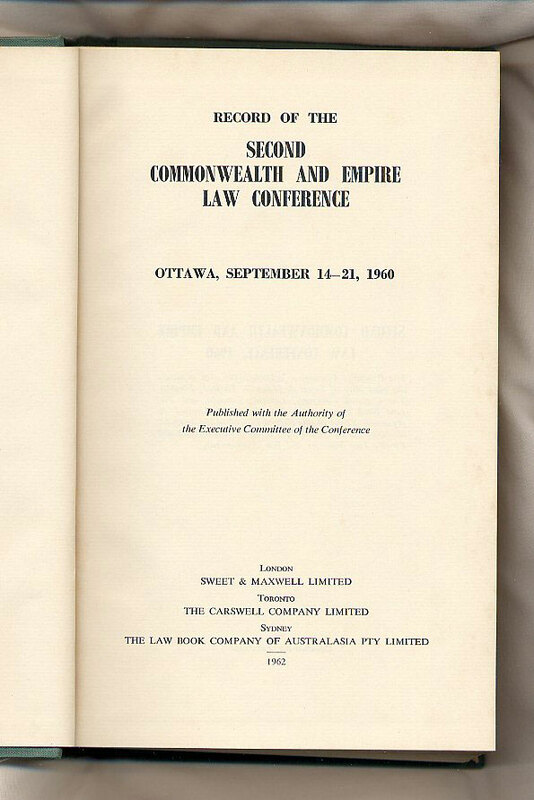 Contains [lxix] 771 printed pages of text. In Fine condition, unused new book. Member of the P.B.F.A. 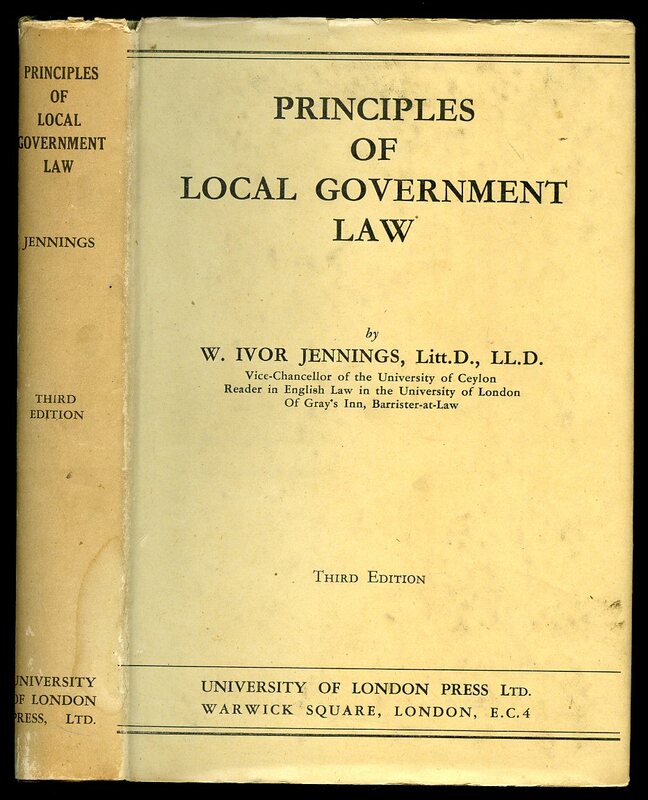 Published by Association of Municipal Corporations, London and Printed by The Solicitors' Law Stationery Society Ltd., Flaxman Terrace, Dukes Road, London 1963. 1963. Hard back binding in publisher's original racing green pebble cloth covers, gilt title lettering and date to the spine, red flecked page edges. 4to 11'' x 8½''. Contains 79 printed pages of text. In Very Good clean condition, no dust wrapper as issued. 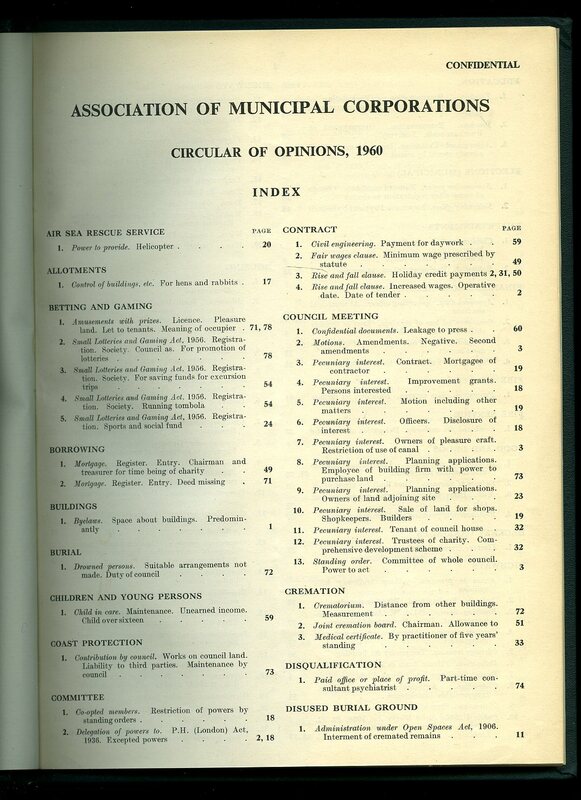 We currently hold in stock 20 other Association of Municipal Corporations (A. M. C.) Quarterly Circular of Opinions years. Member of the P.B.F.A. 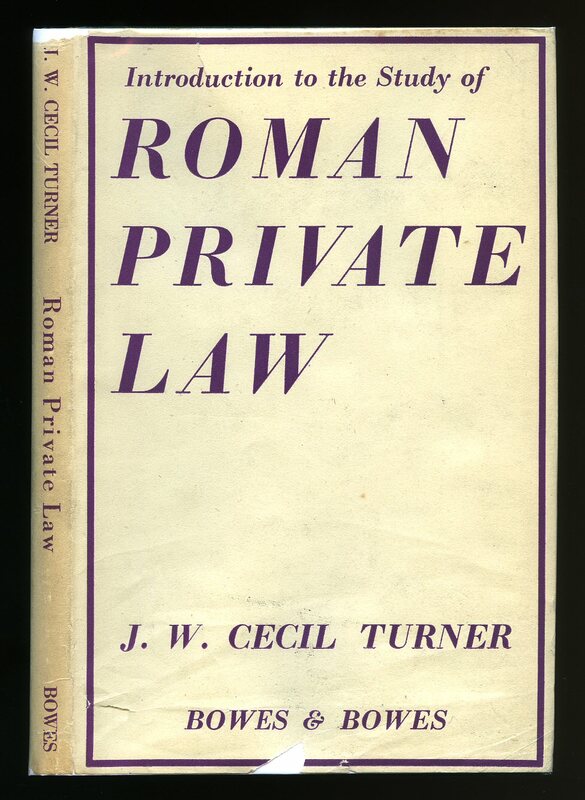 Published by Association of Municipal Corporations, London and Printed by The Solicitors' Law Stationery Society Ltd., Flaxman Terrace, Dukes Road, London 1952. 1952. Hard back binding in publisher's original racing green pebble cloth covers, gilt title lettering and date to the spine, red flecked page edges. 4to 11'' x 8½''. Contains 135 printed pages of text. In Very Good clean condition, no dust wrapper as issued. 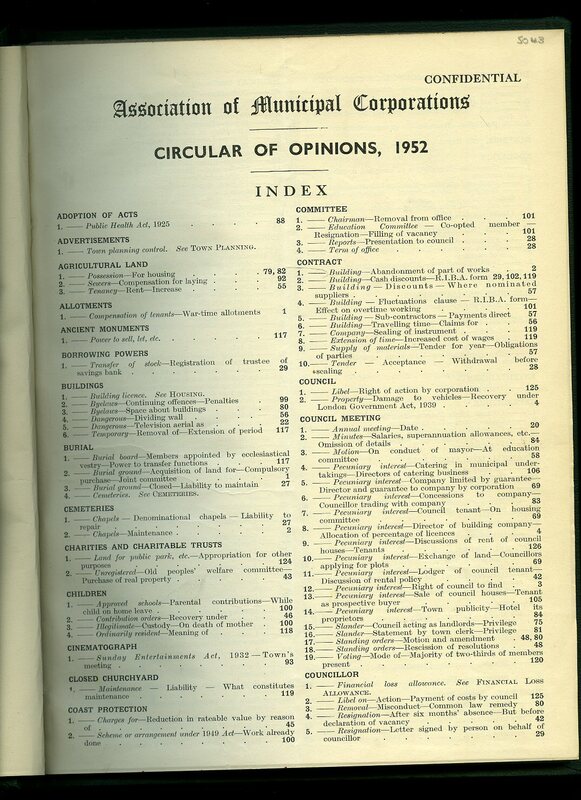 We currently hold in stock 20 other Association of Municipal Corporations (A. M. C.) Quarterly Circular of Opinions years. Member of the P.B.F.A. Published by Association of Municipal Corporations, London and Printed by The Solicitors' Law Stationery Society Ltd., Flaxman Terrace, Dukes Road, London 1959. 1959. Hard back binding in publisher's original racing green pebble cloth covers, gilt title lettering and date to the spine, red flecked page edges. 4to 11'' x 8½''. Contains 104 printed pages of text. In Very Good clean condition, no dust wrapper as issued. 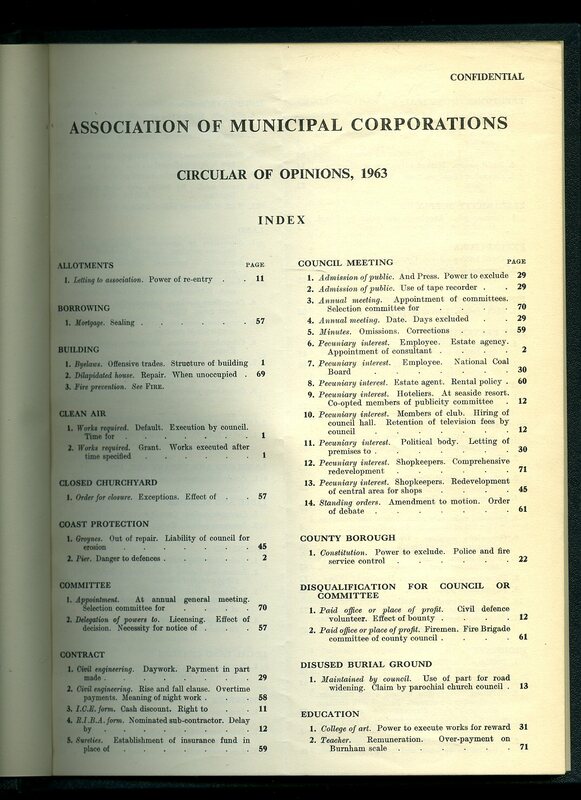 We currently hold in stock 20 other Association of Municipal Corporations (A. M. C.) Quarterly Circular of Opinions years. Member of the P.B.F.A. 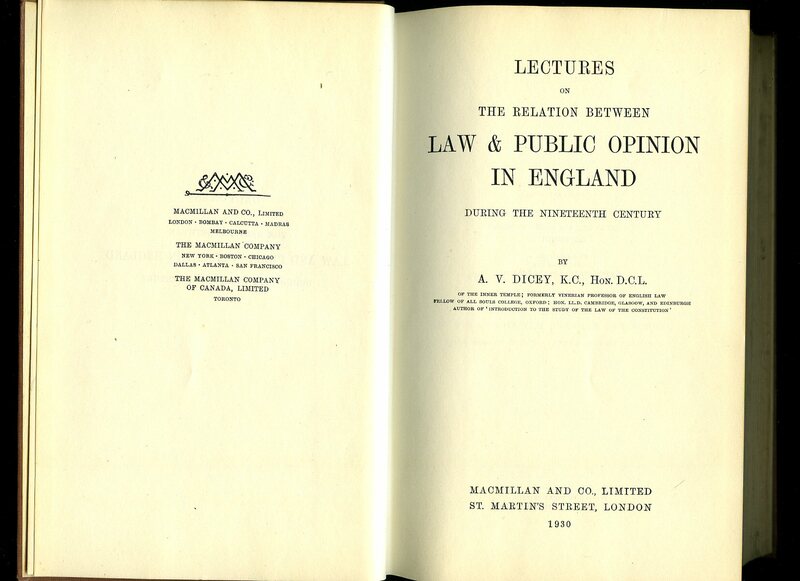 Published by Institute of Art and Law, Bank Chambers, 121 London Road, Leicester First Edition 2000. Leicester 2000. 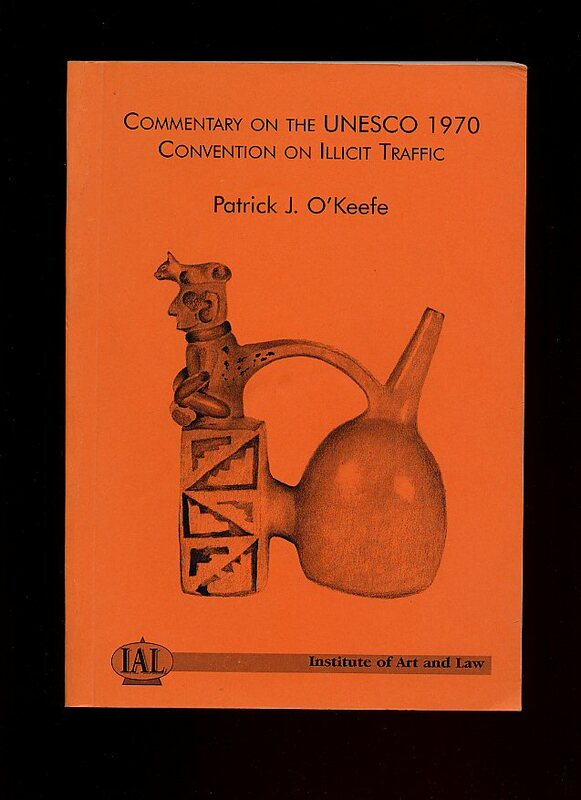 Published by Institute of Art and Law, 1-5 Cank Street, Leicester First Edition 2002. Leicester 2002. Published by Sweet & Maxwell Ltd., London 1962. London 1962. Hard back binding in publisher's original green cloth covers, gilt title lettering to the spine. 8vo. 9½'' x 6¼''. Contains [xvi] 533 printed pages of text with monochrome photographs throughout. Slight dusty age soiling to the closed page edges and in Very Good condition, no dust wrapper as published. Member of the P.B.F.A. Macmillan & Co. Ltd., 4 Little St. Martin's Street, London 1930. 1930. Hard back binding in publisher's original russet cloth covers, gilt lettering to spine. 8vo 9" x 6" xciv, 506, 2 [pp]. In Very Good clean condition, no dust wrapper. Member of the P.B.F.A. 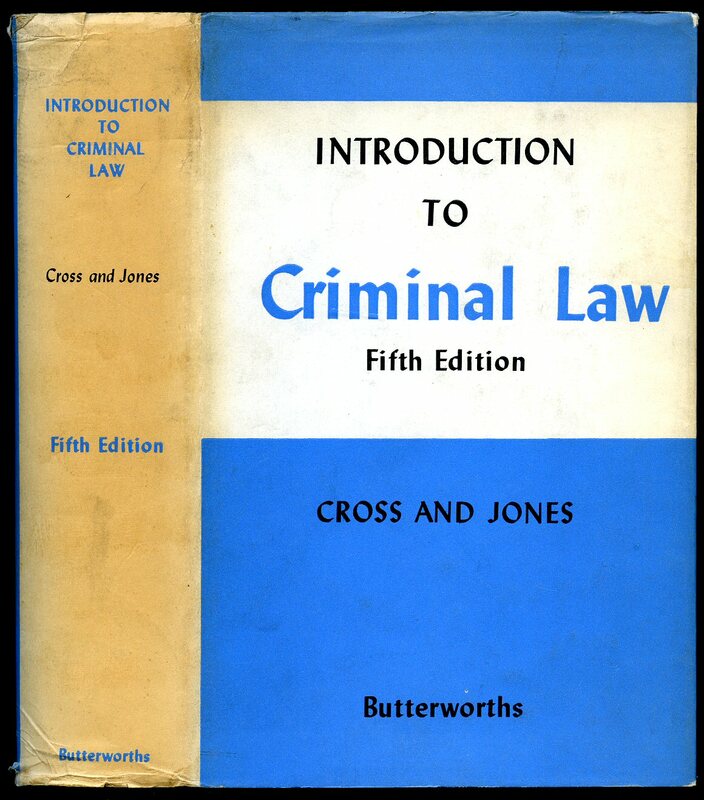 Butterworths, London Fifth edition 1964. 1964. Hard back binding in publisher's original deep burgundy pebble cloth covers, gilt lettering to spine. 8vo 9" x 6" lxxii, 475, 38 [pp]. Near Fine condition book in Very Good condition dust wrapper with age darkening to spine, small rubs to tips and corners, not price clipped. Dust wrapper supplied in archival acetate film protection. Member of the P.B.F.A.